The first thing to know about comic Stewart Lee is that much that has appeared about him in print isn’t true. He was not at Oxford with David Cameron. He didn’t invent Alan Partridge. These misapprehensions get about because people don’t get the fact that … it’s a joke. And the fact that his jokes aren’t all instantly gettable puts people, and some newspapers, on edge. He, like Chris Morris, his partner in crime in his current television series and the inventor of the Partridge canard (Morris claimed recently as a joke, that Lee had indeed invented Partridge, but that in Lee’s mind the original Partridge had been a clockwork elephant), is irretrievably not a conformer. So what is true? He was a writer on the radio version of On the Hour, although his heart remains in stand-up. His stage character is, in his words, a “jealous, delusional, bitter, arrogant and anxious to give a good account of himself”, while the real Lee, clearly, is more likeable and thoughtful. He is seen by his peers as a master practitioner, and the BBC has signed him up for another series after this one, thanks largely to Sky trying to poach him. He is left-wing but, he insists, the joke has to come first. And he feels no particular tribal loyalty to fellow comics. Is the stage version of Lee far removed from the real one? The man sitting in front of me, in a hotel round the corner from the BBC in central London, wears DMs and what his detractors might call agitprop garb, but is almost painfully courteous and trouble-taking. You suspect that, like Barry Humphreys and Sir Les Patterson, he finds playing the ogre quite liberating, as if it’s him without the polite middle-class upbringing. His comedy is neurotic, angry and constantly self-examining. Much of it involves a mantra-like and uncomfortable repetition of politically obtuse remarks that he has picked up. Very often, he admits, he doesn’t know where he is going with the joke. There is usually a safe option, but he likes to test his nerve, often passing comment on his act or his audience. Among those he admires are Arnold Brown, Jerry Sadowitz, Norman Lovett, and Ted Chippington, a 1980s anti-hero and cussed antagoniser of audiences whose proud purpose is to entertain himself. Trouble is, again, it’s a joke, and not to everyone’s taste. So how does he judge success? He’d love to have a garden, he says without missing a beat, for the children to enjoy. You suspect the couple are too busy working to move. There seems little danger of him selling out, maybe doing building society commercials. He thinks, in any case, that his stage character lacks the necessary aura of unfoolable truth-telling. He only performs in smaller venues, and doesn’t enjoy doing panel shows. (Lee Mack once claimed Lee couldn’t cut the mustard, whereas, although he enjoys the company of comics, you suspect green rooms bring him out in a rash.) He is amused that, rather than cashing in on the excellent reviews he has had for his current television series, he is, instead, in the provinces doing nine dates of avant-garderie with contemporary music group Usurp Chance. 1968 Born in Shropshire and adopted by parents who separate when he is four. Raised by his mother in Solihull. the first in his family to go to university. 1986 While studying, he performs with his first comedy group, The Seven Raymonds, with students Richard Herring and Emma Kennedy. 1990 Wins the prestigious New Act of the Year award at Hackney Empire. 2001 Abandons stand-up. Publishes his first novel, The Perfect Fool. Creates the show Pea Green Boat based on Lear’s “The Owl and the Pussycat”. awards. The BBC screens it and receives 55,000 complaints. 2006 Marries comedian Bridget Christie. They have two children. 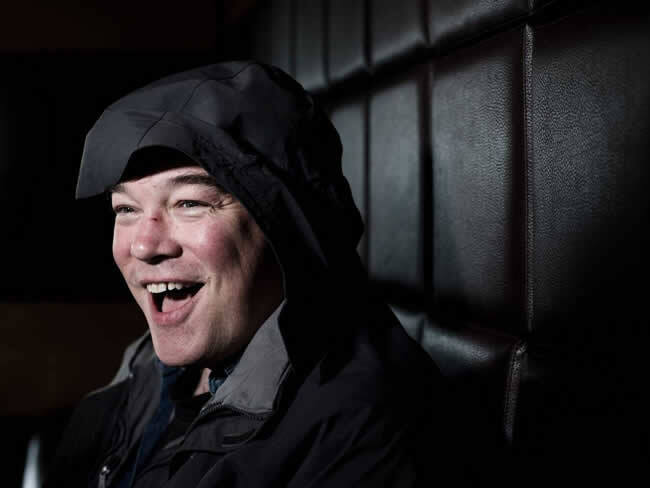 2009 Creates Stewart Lee’s Comedy Vehicle and wins a cluster of awards. 2010 Writes his second book, How I Escaped My Certain Fate – The Life and Deaths of a Stand-Up Comedian. 2014 Prepares third series of Stewart Lee’s Comedy Vehicle.